Imagine taking a bowl of guacamole and a bowl of salsa and combining them...and you've got one amazing and extremely addictive recipe. 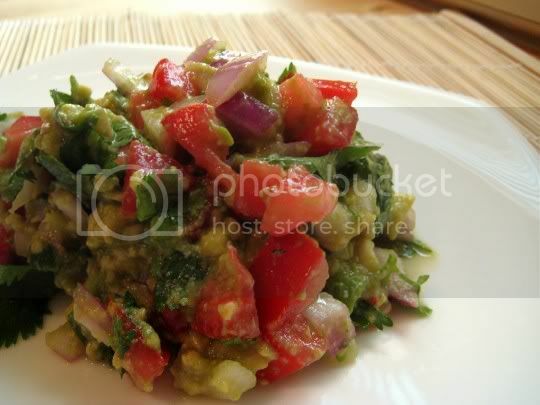 Sweet and juicy tomatoes, spicy and pungent red onions, fragrant garlic, and a little bit of heat from minced jalapeno provide the salsa veggies, while creamy avocado is mashed in for buttery smoothness. Both lime juice and cider vinegar are added, and this changes the consistency some by making the dish more salsa-like than your typical thick guacamole. Still, they add a juicy tanginess that is outstanding, and the sweet juiciness of the tomatoes makes this irresistible. Chopped cilantro adds that wonderful Latin herbal flavor that is a must for both salsa and guacamole. In the end, you've got a sweet, spicy, tangy, creamy appetizer or snack that you could EASILY eat in one sitting...like I did. Make again? Definitely. This could be a regular stand-in for guacamole (and/or salsa)cravings.